If you think getting your oil changed every 3,000 miles and replacing your tires when the tread’s gone means you’ve got preventative car maintenance covered, think again. Keeping your car in tip-top condition involves regular inspection of all your car’s vital parts. Small problems are often hidden until they’re huge, expensive, unsafe problems, so letting them slide isn’t an option. When your wheels are out of alignment, it means your tires aren’t pointing in the right direction. Even a slight misalignment can cause uneven or premature tire wear, decreasing the life of your tires and increasing how often you have to replace them. Another side effect of misaligned wheels and uneven tire pressure is more resistance to the road. If your car has to work harder to move forward, it means you’re wasting fuel—and that’s not only harmful to the environment, but also rough on your wallet. Your car will not handle as well if the wheels are misaligned. In mild cases, this could mean your car pulling slightly to one side, and in extreme cases you might have a difficult time maintaining control, especially in the event you need to take emergency or evasive action. 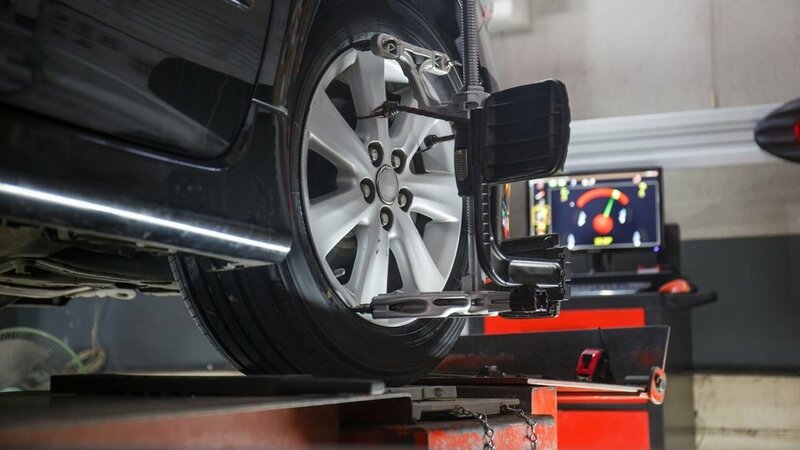 It only takes a slight misalignment to have a huge impact on your tires, steering, and suspension, and that impact gets worse the longer you wait for an alignment. That’s why it’s important to get regular car wheel alignment inspections, long before you actually notice something is wrong. Unlike misaligned wheels, brake pads alert you when maintenance is needed. When the pads deteriorate to a certain point, the calipers rub against a metal indicator that makes the brakes squeal. But if you ignore the squeal and let the pads wear down completely, the calipers can grind into the rotors—an expensive component that will need to be replaced. Not only can fully worn brake pads grind into rotors, but they can also warp or crack them, hindering your car’s ability to stop quickly. And the last place you want to discover that your rotors are damaged is on the road when you need to stop suddenly. Regular brake brake service can help keep you safe. Aside from ensuring brake pads are in good shape, regular brake inspections will check the level of your car’s brake fluid. If fluid levels are low, you won’t have the pressure to brake properly—something you might not notice until you need them the most. In damp environments, water can build up in the brake fluid over time. This can lead to corrosion, leaks, and brake damage, and with hard use, water build-up causes brakes to severely fade or even fail. While San Diego isn’t typically a damp environment, we’ve had enough rain this winter for water-build up to be a real concern. Don’t wait until it’s too late. Get your wheels and brakes inspected now. If it’s been a while since you had a car wheel alignment or brake inspection—or worse, if you never have—bring your car down to General Auto Repair. We specialize in preventative car maintenance as well as car repairs. Don’t wait for a small problem to turn into something big and expensive. Give us a call today.